It’s about time we talk about Radeon 300 series, which are expected to hit retail channels next month. First and foremost, Hawaii-based GPUs will not feature any kind of HBM implementation. The rebranding of Radeon R9 290 series will be limited to overclocking and (most importantly) the addition of 4GB memory (at the time of writing I’m not aware of 4GB models, but those are also a possibility). The codename of Hawaii-based Radeon 300 cards is not confirmed. Right now these cards are detected as R9 300. The Radeon R9 380 (both retail and OEM verion) is most likely rebranded R9 285. That said, we can’t really be sure if Hawaii models are codenamed R9 385 or R9 390. Hawaii-based R300 cards are only slightly overclocked. The Hawaii XT model has 1050 MHz core clock and Hawaii PRO 1010 MHz. That’s a subtle increase, limited not by the silicon, but TDP. The memory clock however, will get more juice. The speed has been increased to effective 6 GHz (1500 MHz), which means Hawaii R9 300 cards will have 64 GB/s higher memory bandwidth than R9 290 series. 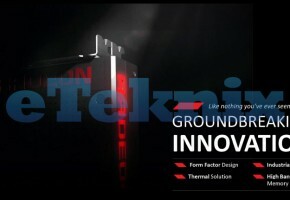 The Radeon 300 high-end segment will surely stand out from competition. Both Fiji and Hawaii models will have higher bandwidth than GM200 based TITAN-X and GTX 980 Ti. AMD is clearly targeting 4k+ resolutions with their next lineup. 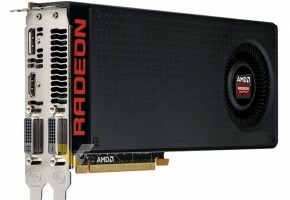 Here is the list of all confirmed Radeon 300 graphics cards. Some cards are missing from this list (because they are not confirmed): R9 380X (full Tonga), R9 370X (overclocked R9 370? ), R9 360X (full Bonaire). The Hawaii-based models are direct competitors to GeForce GTX 980, whereas both the cut-down and full Fiji cards are competitors to GTX 980 Ti and GTX TITAN X respectively. Things to note. Some cards are detected as R7 300 series, while they are in fact R9 300 parts. The “clocks” column may not represent the final clock speed of particular model, as some cards can still be seen with different configurations. *** Based on leaked slides. In other news. You might have seen this post, where the first alleged picture of Fiji-powered graphics cards was revealed. The picture itself was found by WCCFTech in official Product Roadmap. 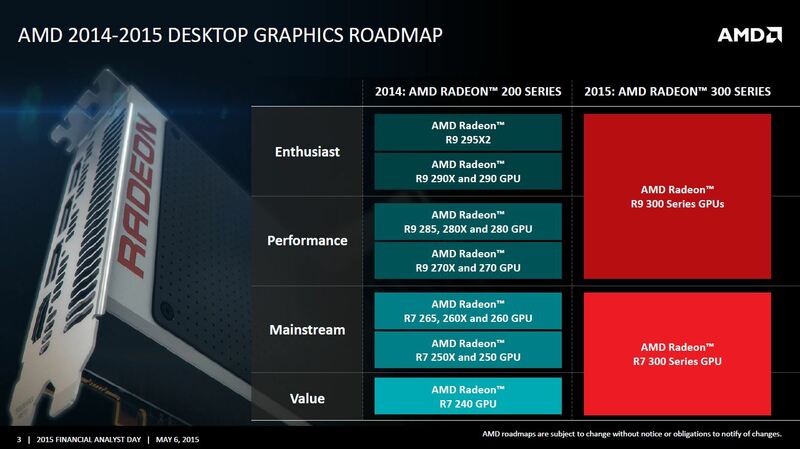 Surprisingly, AMD removed the render from the presentation, which points to very unfortunate mistake by AMD’s PR team. Or maybe, it was all done on purpose? In fact, it is the most useless roadmap I’ve ever seen, so practically there was no other reason to publish this slide, other than intentionally leak this render. 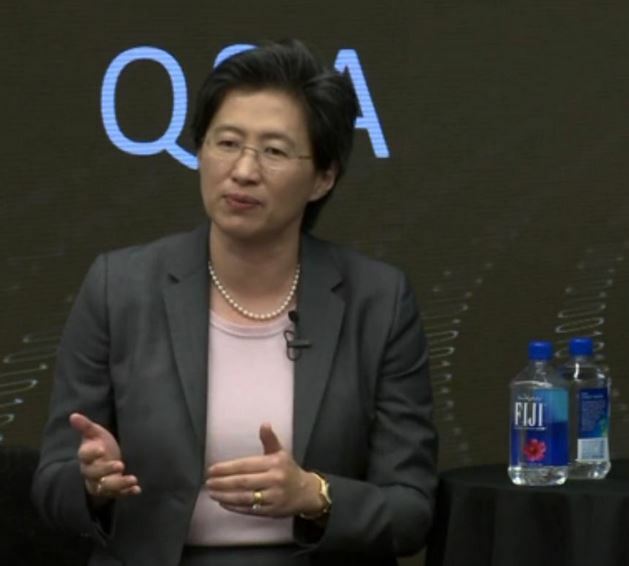 AMD has never officially confirmed that the next-gen GPU will be codenamed Fiji. The company did however, gave us some hints. 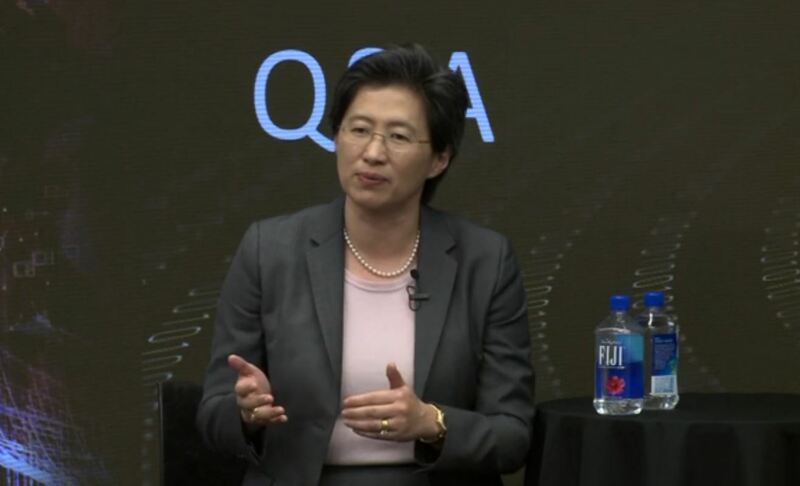 We already told you that during the Q&A with Lisa Su carefully placed FIJI branded water bottles could be seen during the webcast. That’s an obvious hint for watercooled Fiji models. The other hint can be found on AMD website. 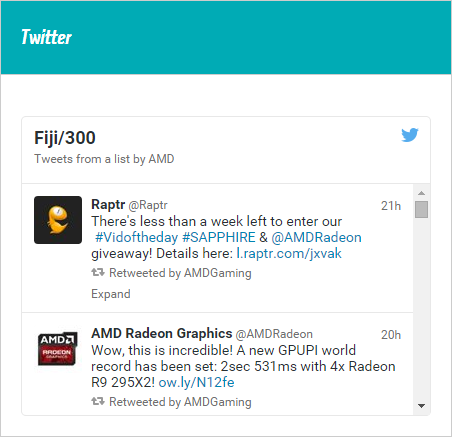 If you go to this page, you can see an embedded Twitter list, which is titled Fiji/300, clearly indicating that Fiji is part of Radeon 300 series. It is important, because some rumors point to Fiji coming as part of Radeon 400 series.. The last thing I wanted to talk about is the mobile lineup. 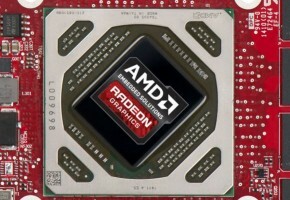 The three desktop OEM parts were not the only graphics processing units announced by AMD during Financial Day. 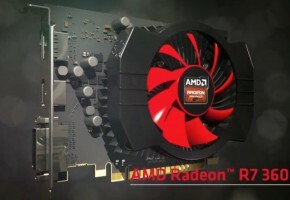 Radeon M300 series were also announced, although these cards are not even listed on AMD website (unlike desktop OEMs). So I came up with this list, of all confirmed Radeon M300 graphics cards. Judging from my information (and benchmarks I saw) the fastest mobile Radeon graphics cards is only slightly faster than current mobile flagship — Radeon M295X. In fact Radeon R9 M395X is around 10% slower than GeForce GTX 980M, so it does make us wonder if AMD has yet again, used the same Tonga silicon (aka M295X) as flagship mobile GPU. It is not surprising actually, because AMD has trouble competing against Maxwell GM204 in this power envelope, and that’s something I can understand. What I can’t understand are 21 models, which often only differ in clock speeds. But I will make this simple for you, if you are planning to buy Radeon M300 powered gaming notebook, just don’t consider anything below Radeon R9 M380X, or GeForce 940M (GM107) if you are into ‘green stuff’. A small digression. If AMD decided to make M395X, maybe they are also planning desktop 395X? 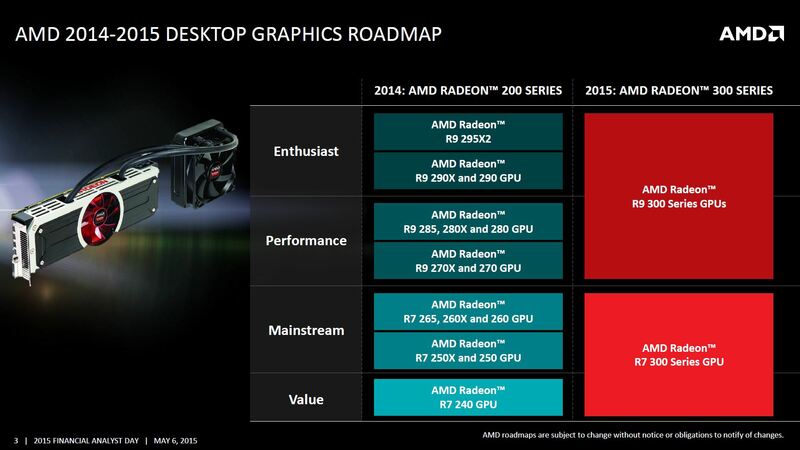 The second part of this chart includes integrated GPUs branded as M300 parts, Radeon R8 M300 to be precise. There are of course Radeon R2, R3, R4 and R6 graphics, but those were not confirmed yet. 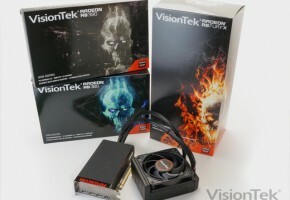 AMD Radeon R9 M395X Radeon R9 M295X ? AMD Radeon R9 M380X ? ? AMD Radeon R9 M370 ? ? AMD Radeon R8 M360 – ? AMD Radeon R8 M355 – ? 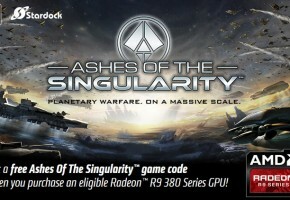 In this post we are not talking about launch dates for Radeon 300 series. I’m fully aware of the ‘leaked’ information, but as long as we cannot confirm them, we will not consider them true. Things should get much clearer in the coming weeks, so stay tuned for more.